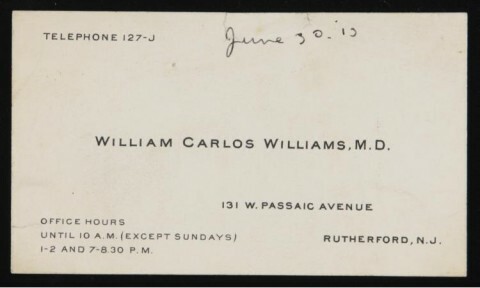 There you have it: the business card of William Carlos Williams. Yes, that William Carlos Williams. Imagist poet, novelist, playwright, essayist, critic, writer of short stories — and New Jersey pediatrician. Would any of us, upon reading his written work, have advised him not to quit his day job? And yet quit it he did not, practicing medicine by day and writing in the evenings. Given that his office hours evidently ran to 8:30 p.m., he must have spent some seriously late nights at his desk. But because Williams burnt the candle at both ends, we may today enjoy poems like The Red Wheelbarrow, This is Just to Say, and the vastly longer Paterson, an adaptation into verse of the city of Paterson, New Jersey. Such poems show that the concrete and the everyday — just the things you'd expect a small-town family doctor to deal with — never escaped Williams' attention. Critics tend to cite one phrase from Paterson that sums up this sensibility: "No ideas but in things." A special thanks goes to Steve Silberman (aka @stevesilberman) for sending Williams' business card our way. Colin Marshall hosts and produces Notebook on Cities and Culture. Follow him on Twitter at @colinmarshall.